And as always, we feature content from the MGI data and analysis platform, a summary of the week’s key statistical releases, and a look to the week ahead in data. 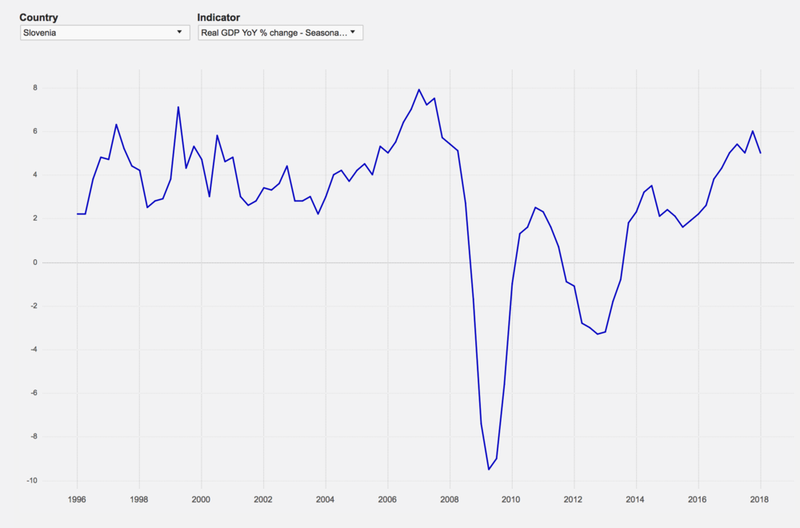 In this newsletter, we use the NATSTATS section of the MGI platform to look at real GDP growth in Slovenia over the past twenty-two years. The Slovenia Democratic party (SDS), headed by former Prime Minister Janez Jansa, won the general election held on 3 June. With almost all votes counted, SDS secured 25% of the ballot. In total, nine parties have entered parliament, including the far-right SNS. The following day, Slovenian President Borut Pahor said to a local newspaper he would give Jansa the mandate to form a government –even though he is not obliged to. As SDS needs to ally with at least two other parties to have a majority in parliament, the party’s leader said he is “open to co-operation” and recognisesthat talks for a governing coalition could take some time. The poll results in Slovenia follow the elections in three neighbouring countries (Austria, Hungary and Italy), where anti-immigration parties performed strongly. Like all these countries, Slovenia has been on a key migration route from the Middle East and North Africa to Europe. Interestingly, according to the Financial Times, the director of the Center for Southeast European Studies at the University of Graz, Florian Bieber, said there was no "Orban effect” in Slovenia. SDS's share rose by 4.2% compared to the 2014 elections – thus showing "no populist xenophobic wave" – while SNS won only 4.2% of the vote. Greece has decided to delay a planned bond issue due to the increased political risk in Italy that hit eurozone debt markets. “We examined the possibility of an issue before the end of the bailout but after the recent turbulence it is not going to happen”, said a government official to Reuters. The planned bond issue – probably a 10-year bond issue – is likely to be delayed until the fall, when the country hopes it will have secured further debt relief from its official lenders. Over the past two weeks, the yield of the 10-year Greek bonds rose by roughly 0.5% (to 4.5%), while the yield of the 7-year bond issued in February, rose by around 58 basis points, before dropping to 4.24% on 6 June. Italy’s UniCredit is plotting to merge with French Societe Generale, a move that would combine two of Europe’s largest financial institutions. According to the Financial Times, UniCredit's CEO Jean-Pierre Mustier has been developing the idea for several months. The newspaper also reports that even though a formal approach has not been yet made, Societe Generale directors have also been exploring the possibility of a merger. However, SocGen denied “any board discussion regarding a potential merger with UniCredit”, while UniCredit declined to comment on the Financial Times report. This isn’t the first deal UniCredit has considered. In late 2017, the bank expressed its interest to the German government about the possible acquisition of Commerzbank. This week, we use the NATSTATS section of the MGI platform to look at real GDP growth in Slovenia over the past twenty-two years. During the 90s and the early 2000s, GDP growth fluctuated around 5% and steadily increased in the years following 2004 – the year when the country joined the EU – recording an all-time high of 7.9% in 2007Q1. The Slovenian economy shrank in the following years, with the indicator dropping to -9.5% in 2009Q2. Since then, the economy has significantly rebounded, even though the recovery was briefly disrupted by a banking crisis in 2013. In 2017-2018 real GDP growth stood at around 5%. Next week we expect data on inflation and industrial production for several Mediterranean countries, as well as unemployment rate / employment for Albania, France, Italy and Greece. MGI’s complete data release schedule can be viewed at our release calendar section.